Oil and water don’t mix, right? For the most part, that’s true. Oil is made up of many compounds, the majority of which are not water soluble or “non-polar” in scientific terms. When oil enters water, such as from a spill, most of it gathers together in balls or sheets. However, a small portion of oil is “polar” and can dissolve in water. Scientists have long been aware of some polar oil compounds, but they have not been able to identify all of them. In a recently-funded Gulf of Mexico Research Initiative study, “Weathering of Petroleum and Dispersant Components in the Aftermath of the Deepwater Horizon Oil Spill,” Drs. 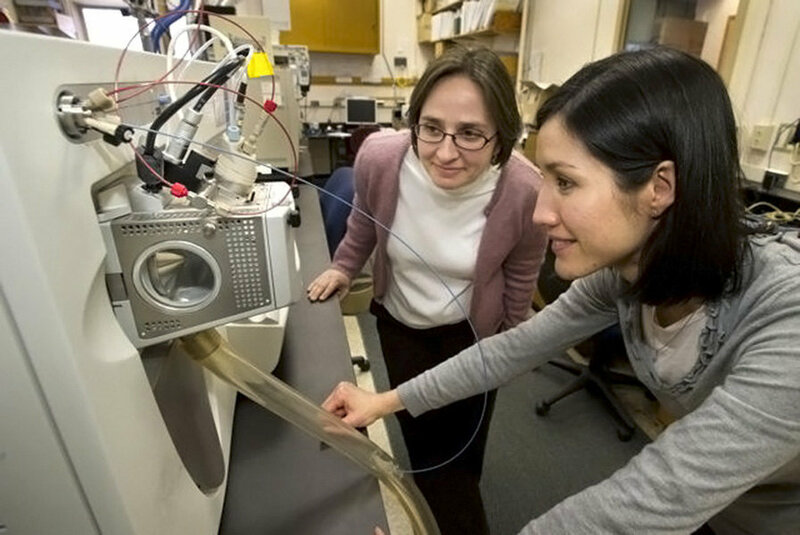 Liz Kujawinski of Woods Hole Oceanographic Institution (WHOI) and Helen White of Haverford College will specifically look at the polar part of oil in both water and sediment. They will work to identify compounds that inhabit the polar portion of oil and the impact on these compounds when they interact with biological agents, such as oil-degrading microbes. Oil composition is not uniform and there can be thousands of compounds in a single drop. Dr. White explains that when oil is first released, up to 15 percent consists of polar compounds. As oil weathers, its chemical composition changes and the polar portion of oil can rise as high as 70 percent by weight. In the past, many scientists focused on the non-polar compounds, largely because oil separated from water is easier to study and tools limited the scope of characterizing oil contents. But now with new analytical methods that Kujawinski first deployed to follow dispersants in the Gulf of Mexico after the Deepwater Horizon oil spill, she and White can begin to unlock the mysteries of the polar portion of oil. Among other equipment, a gas chromatograph and a specialized mass spectrometer that measures the weight of atoms and molecules to the fourth number past the decimal will help them identify the unknown compounds. 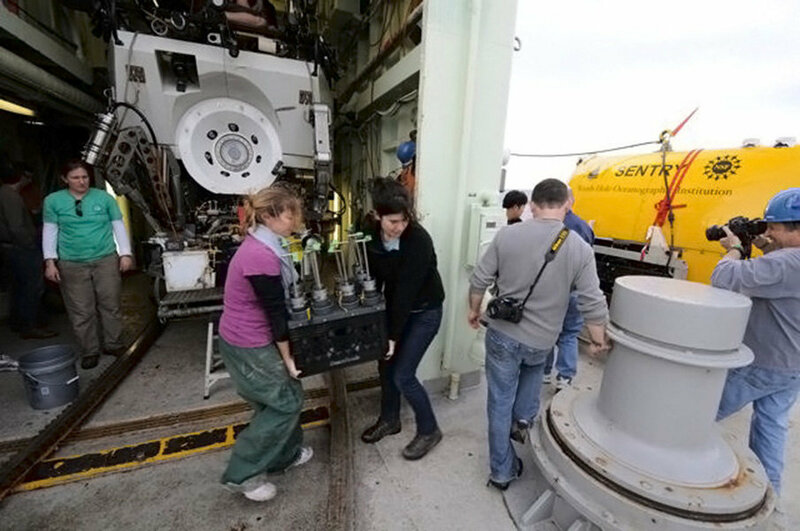 In the months immediately following the 2010 oil spill, Kujawinski and White received NSF RAPID grants and collected the samples they will use in this study. Kujawinski’s water samples came from various distances of the well-head, with oil ranging from relatively pure to progressively more degraded. For this study, she will use her specialized equipment and techniques to break new ground in understanding the chemical structure of oil. White’s sediment samples came from various sites in the northern Gulf. For this study, she will focus on the oil-eating microbes that naturally degrade oil and their interactions with these polar elements. Toxicity is an obvious concern for these unidentified oil compounds, especially with the likelihood of water-soluble compounds more easily entering the food web than would compounds that have a tendency to separate and rise to the surface. Previous studies of the polar portion of oil have detected some known toxic compounds such as naphthenic acids, but White explains that there is currently no definitive answer on the toxicity of polar oil. Though Kujawinski and White will not run toxicology studies on the samples, their work to name polar compounds in oil will be an important first step in gauging additional potential danger. As the two researchers identify more of the water-soluble compounds, marine scientists can begin the process of understanding how these compounds might impact the ocean ecosystem. The results of this study will provide a springboard for other relevant research on the topic. White has started the process of analyzing sediment samples in her Haverford lab with the help of her undergraduate students and a post-doctoral researcher. Kujawinski is readying her lab at WHOI for the arduous task of teasing out the individual components of polar oil found in the water column—a long process that will involve first identifying the compounds in the water, the non-polar oil, and any dispersant in the sample before tackling the polar components. While the two have shared information before, this is the first project they have worked on together. Both are eager to see what they discover as a team. This research is made possible by a grant from BP/The Gulf of Mexico Research Initiative. The GoMRI is a 10-year, $500 million independent research program established by an agreement between BP and the Gulf of Mexico Alliance to study the effects of the Deepwater Horizon incident and the potential associated impact of this and similar incidents on the environment and public health. Permission granted for the one-time and non-exclusive use of the images for purpose of an article on the GoMRI website. For future uses please contact the media office (media@whoi.edu). Images displayed online may only be shown at 72dpi to prevent unauthorized downloading of the images.